July 27 is the 60th anniversary of an armistice between belligerents on the Korean Peninsula. 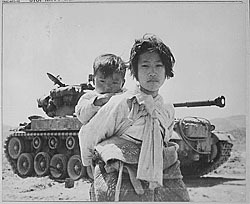 The agreement ended formal hostilities between the UN forces (21 countries in all, but primarily US troops), and those supporting North Korea - primarily China with the Soviet Union in sympathy. The armistice was supposed to lead to a peace agreement of some sort, but it never materialized. The line of disengagement - roughly following the 38th parallel - is called a demilitarized zone, but is in fact one of, if not the foremost, fortified border in the world. As an article in the LA Times described it, "On one side of the world’s most heavily fortified border, North Koreans are celebrating Saturday’s 60th anniversary of the armistice that halted the Korean War with Victory Day fireworks and a military parade. In South Korea, Armistice Day is a time for somber reflection – on the 1.2 million killed on both sides of the 38th Parallel, on the division that cleaves families these six decades later and on the long-elusive quest for a peace treaty to formally end the conflict." As an ABC news article summarized, "Communist North Korea invaded South Korea with 135,000 troops on June 25, 1950, and three years later with more than 2.5 million dead, including more than more than 36,000 Americans who died in combat, the war ended." Today, more than 28,000 US troops remain in South Korea as a significant deterrent force against a resumption of hostilities. The ideological freeze between "the proletariat" and "the forces of imperialism" has endured in North Korea through the collapse of the Soviet Union, and the continued movement in China towards a controlled, yet free-market economy. North Korean governance has evolved as well, however, not improving just turning into a family-dynasty, typical of old-time monarchies, and modern-day strongmen and dictatorships. South Korea is a vibrant, prosperous nation of nearly 50 million, while North Korea holds a population of just over 24 million, and according to UN analysis, half of whom live in "extreme poverty." Military parades, perpetual vigilance against outside forces, privileges for a royal few and their military elite is the mainstay of North Korea 60 years later - what a legacy (and testimony against entrenched and brutal control).